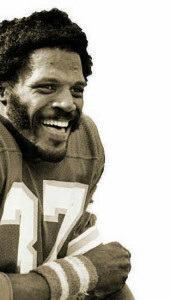 Joe Delaney was a rising star when he died while trying to save others on June 29, 1983. It was 30 years ago, June 29, 1983, when the sports world lost a true hero and budding star with the tragic death of Kansas City Chiefs running back Joe Delaney. What should have been a fun summer day spent at an area amusement park in Monroe, Louisiana, instead turned tragic as three young boys were drowning in a water hole that had been left by recent construction. Though he could not swim, the 24-year-old NFL star quickly jumped in to try and save the boys. Two of the boys made it to shore, though one later died, while Delaney and one of the boys drowned. It was a tragic and sudden end to what had been a mercurial rise from obscurity to NFL stardom for Delaney. After playing primarily receiver at Haughton High School in Bossier Parish, Louisiana, Delaney received some Division I interest, but ended up at Division I-AA Northwestern State. He quickly was moved to running back and twice earned All-American honors. In a 1978 game against Nicholls State, Delaney rushed for 299 yards, including an NCAA record 263 yards in the second half. He finished his career with 3,047 yards rushing and 31 touchdowns and had his jersey retired after his final game for the Demons. He was inducted into the College Football Hall of Fame in 1997. Likely because he didn’t play against top-level college competition at Northwestern State, Delaney slipped into the second round of the 1981 draft before being selected with the 41st pick by the Kansas City Chiefs. As a rookie, Delaney proved to be the best weapon on a team that posted a 9-7 record under the guidance of future Hall of Fame coach Marv Levy. Delaney was known for his good deeds and was a team and fan favorite with the Chiefs. After gaining a combined total of 211 yards on the ground during the first four games of his rookie season, Delaney reeled off three straight 100+ yard games, including 149 yards in a victory over Denver. 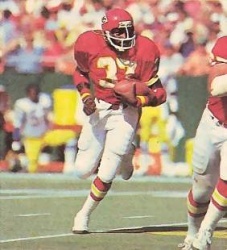 Delaney later rushed for 117 yards in a two-point loss to San Diego and 193 yards in a victory over the Houston Oilers as the Chiefs raced to an 8-4 record and looked like a playoff contender. However, they were derailed by the Detroit Lions on Thanksgiving Day and Delaney struggled with injuries the next two weeks as they lost three straight games. He rushed for only 136 yards in his final three games and missed the season finale (a 10-6 win) against the Minnesota Vikings. Despite the tough finish, Delaney still completed his rookie year ranked 10th in the NFL with 1,121 yards rushing and was a first team All-AFC and Pro Bowl selection. Delaney’s second NFL season was not as successful as he never was able to find a running rhythm during the strike-shortened season. He suffered a detached retina that limited his playing time and he rushed for only 380 yards in eight games. Tragically, Delaney would never have another season to regain his rookie form. After his death, more than 3,000 people attended his memorial service on July 4, 1983. He was posthumously awarded the Presidential Citizens Award by President Reagan and later received the NCAA Medal of Valor. It would be seven seasons before the Chiefs would have another 1,000 yard runner (Christian Okoye in 1989). Though his number has not been worn by a Kansas City player since his death, Delaney’s number 37 has not been officially retired by the Chiefs. It would be a fitting tribute and remembrance 30 years after his death for the Chiefs to rectify this oversight. Because Delaney definitely deserves to be remembered both for his greatness on the field and for his selflessness off the gridiron.